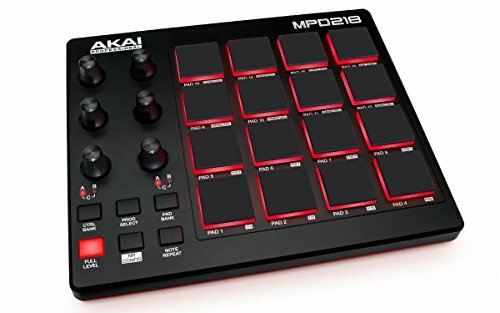 What do you get when you cross an Akai Mpd32 with APC controller?Akai newest pad, fader, encoder and step sequencer midi controller the Akai Mpd 232. This controller is a mix and blend of some of Akai’s most famous music producing technology and hardware designs that have shaped the sounds of hip hop, house and electronica for over 20 years, and are still going strong today. So, if you want a mixture of controls over your DAW, VST, Plugins and drum libraries and you find yourself getting lost or tripping over yourself with the new influx of 64 pad grid controllers on the market, then the more traditional use and layout of the 232 might be appealing to your fingertips and production style. Its unanimous that these are some of the best pads on the market today, and if you’re intending on finger banging beats like ya name is Araabmuzik then you need pads that can take a beating and at the same time be inviting to your fingertips. As Akai like to call them, these 16 low profile, rubberised, grippy, velocity sensitive, multicolor backlit RGB pads are FAT and make producing a pleasure. Producers can access up to 64 assigned pads over 4 banks on the 232. Simply switch up and change your bank’s (kits) by choosing any of the 4 buttons located above the 16 pads. This can be done while finger drumming, recording or step sequencing out tracks and pattern on the fly. Akai have kept the old school feel and functions of the mpc at your fingertips on the 232. Located just below the 4 X bank button are some the cornerstones of the mpc such as note repeat, tap tempo, 16 level and full level. One thing i’m not crazy about when it come to the real estate and lay out of the Akai Mpd 232 is the positioning of the transport controls. WAY up the top left side of the 232 live the stop, play, record and sequence record buttons. Most beat makers and users of the mpc and NI machine are use to these controls living on the bottom left and right hand corners of the machine, this positioning makes for easy access and a more fluid workflow when arming and recording that first sound via the pads. I just feel like your hands are traveling around the controller to much when you perform the fairly constant tasks or play, stop, record and it’s a rush to get your hands back in battle mode after you have armed the record setting. When it comes to the pads it has to be mentioned that some users in the comments and reviews on amazon have complained about double triggering and ghost notes sometimes being an issue with the 232 when playing more complex midi patterns. I have seen an Akia rep reply to one users comment by saying that this can sometimes be an issue with the 232 when the velocity setting are set to their maximum. So that means that Akai Professional are aware of this issue and i’m sure they will fix this bug in the next update, hopefully by the time you have read this review. Akai boast a massive 72 assignable controls on the 232 but these are not accessible all at the same time, and unless you’re an octopus or a meth induced gabba producer then having complete control over 8 X faders, 8 X rotary encoders and 8 x buttons per control bank is more than enough to get the job done. The 232 comes midi mapped for all the major DAW’s and does not require drivers, so just plug and play. If you want to get more involved with the mapping, settings and arrangement of the midi controls, then this can be done by loading presets, or editing parameters and setting for each of the 72 controls and 16 from the edit and global option that are located under the LCD display. Akai have kindly included a 64 part, 32 step sequencer into the design, controls and built-in editing software of the 232. There are 3 different ways producers can approach creating and performing with the step sequencer, each style as a unique workflow and ability to craft out your tracks, or play live to suite the individual. If you look closely at the 232 you will notice that there is a vertical strip of 16 buttons below the fader section of the controllers. This style of step sequencing has been taken from the drum machines and grooveboxes of the 80’s and 90’s from classic like the TR-808 and 909. So, once you have trigger a pads then this particular sound is able to be sequenced on the neighbouring horizontal 16 button, kicking off the step sequencing pattern. A typical house kick drum pattern would have note pushed in at the buttons 1,5,9 and 13 to get that that classic 4 to the floor thumping kick to start of your pattern. Once you are happy with the sequence of one particular sound then just tap the next pad of choice and start to enter the next pattern of notes into a clear 16 or 4 bars in the horizontal step sequencer mode. If you are finding your beats and loops to rigid and almost robotic and lacking in movement then you can access all of the quantise, swing and bpm options from the LCD screen and the use of the navigation keys and dial. Finger drummers and traditional hip hop styled beat makers can still adopt the power and functions of the 232’s step sequencer into their workflow. Basicly just play your drums, synth or sounds out on the 16 pads as per usual, this will then create a pattern inside of the step sequencer that you can now edit, solo and manipulate from16 button horizontal step sequencer below the faders. Akai also include additional software for the 232 that allows you to go in and digitally add the note and create sequencers with the mouse. I personally would not find myself going down this route very often if at all, because for me personally I would rather do this type of programming in my DAW of choice as I’m more familiar with its functions and capabilities. What kind of deal would this be if the team at Akai didn’t throw in some extra goodies to get your on your way when you pop this package open. So whats is the box? Technology and the hardware that allows you to control and create great music from your computer is getting better and cheaper every year. So if you’re looking to get some state of the art pads, faders and encoders into your studio then the Mpd 232 is a great addition that is not going to break the bank. Not forgetting that you will get to learn and experience creating music with a traditional step sequencer in a digital environment. If you’re all about the pads and you intend to travel the globe with your midi controller then check out the little brothers of the Mpd range. The Mpd 218 is shipped with the same high quality RGB, velocity responsive pads plus 6 knobs to get your groove on, all from the comfort of your backpack. If you’re a die hard ableton live users looking for a pad based controller check out our reviews on the Ableton Push 2 and the Launchpad Pro, both of these are great midi controllers that can help you push your production skills to the next level and kill hours of time getting lost in the land of music production.